I’ve often heard that when a quiet person speaks, listen. With Andrew, this couldn’t be more true. I frequently wonder what is going on in that head of his. If you look in his eyes you know, the wheels are always turning, but with what? His level of focus is remarkable and his attention to detail is inspiring. It’s like he conserves his energy in the stillness of his concentration and then bursts into action to get things done. And when he opens his mouth, the value in what he says is staggering. What goes on between the silence, the action, and the speaking is beyond me – and I’ve been married to him for six years! – but whatever it is, it drives him to get things done no matter what it takes. Andrew is a resilient man – not impenetrable, but very humanly resilient. He commits to a task and he gets it done. His motivation stems from the heart. For him, it’s less about the cars and more about the people that drive them. It’s one of the first things that attracted me to him. He really cares about people and has a drive to help them, whether stranger or friend, in whatever way he can. He won’t let an obstacle get in the way of his goal. He always finds a way around it because the people he serves as a mechanic mean that much to him. 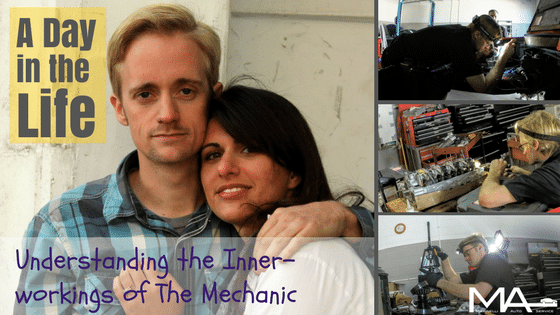 This attribute is what motivated him to change gears from music teacher to mechanic. He sought a way to help people in a practical way, so he set down his music degree and sought a career as a tradesman. He will still sit down from time-to-time and massage a tune out of a piano, but these days those gifted fingers are influencing a vehicle back to good health. He doesn’t so much enjoy the mechanics as much as that he’s really good at it and is driven to get better so he can continue to help people. It’s Andrew’s intelligence and uncommon love for people that drives him out of bed at 6:30am to head to the shop before it opens. He’ll grab whatever is in the fridge that will give him energy for the day (pizza, cheese or hummus and bread, leftover spaghetti, etc…), though sometimes he needs to be reminded to eat because he gets so focused on the job at hand. He rolls into the shop, spends some time cleaning or preparing his mind and heart for the day ahead. A few minutes are spent touching base with the employees, Mike and Jonathan, and then he gets to work, praying all the while for uninterrupted time to maintain his concentration on each vehicle on the schedule for the day. At 6pm, when the shop is officially closed, the other guys usually (unless there’s an urgent matter to attend to) begin wrapping things up to head home. Andrew presses on for another few hours, at least. He usually aims to leave the shop by 9pm, but sometimes another hour or a few more after that. If he says he is going to get something done, you better believe he puts everything he has into getting it done. Monday through Friday, this is what Andrew’s life looks like. Saturday is a little different, the shop isn’t open, so it’s a day when he can be fairly certain of no interruptions. So, he goes in to wrap up a job that didn’t go as planned over the previous days or spend time focusing on the business end of things. It’s a day when he can let the phone ring to voicemail and find unbroken concentration. Sunday morning comes and Andrew is horizontal and will remain that way most of the day. Sure, he’ll spend some time playing with our son, but it’s mostly a day of recharging. Reading, watching TV, napping, and maybe a short trip to the park. It’s the only way this introvert can get up on Monday and do it all over again. He does it for me and our son, but also for you and your family so you can get wherever else life takes you.